Madison College freshman softball player Brenna Seeber (3) prepares to slap the ball during a recent game on the team’s Florida trip over spring break. The WolfPack’s first home game of the season is scheduled for April 3. Madison College softball fans will have to wait until April 3 to see their team play a home game. Still, thanks to two indoor tournaments and a Florida spring break trip, the team has already played 22 games and faced all of its conference opponents. 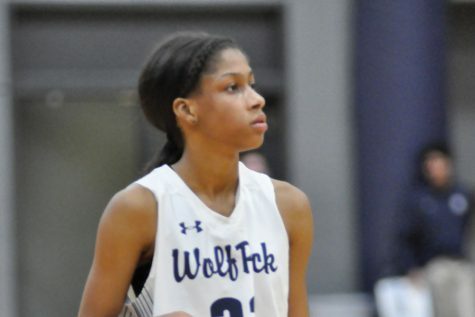 The WolfPack won 6 of 13 games on its recently completed spring break trip, facing mostly teams from throughout the Midwest and now stands at 11-11 overall. Madison College played in the North Central Community College Conference Jamboree in The Dome in Rosemont, Ill., from March 4 -6, beating every conference opponent except for Rock Valley College. The team’s conference record is now 4-1. A glance at the team’s statistics so far this season reflect its .500 season to this point. Madison College has a higher batting average and lower ERA than its opponents, but is making almost twice as many errors. The WolfPack’s team batting average is .299, compared to .274 for the opposition. Freshman Breanna Seeber leads the team with a .443 average, posting 31 hits in 70 trips to the plate. Brooke Heck, another freshman, follows close behind with a .435 average. Heck has 30 hits in 69 at-bats, including a team-high nine doubles. 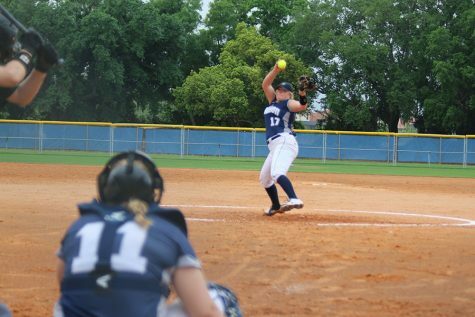 Madison College’s pitching staff has been led by sophomore Jenalee Wilson, who has posted a 7-3 record and a 3.23 ERA. Wilson has struck out 42 batters while allowing 26 earned runs on 64 hits in 56.1 innings pitched. Freshman Hannah Jensen has a 3-5 record, but only gives up 3.79 earned runs a game. She has allowed 28 earned runs on 63 hits in 51.2 innings. Fielding, though, has been a bit of a struggle for Madison College. The team has committed 62 errors compared to 35 errors by its opponents. As a result, the WolfPack has given up 48 unearned runs, or more than two a game. Now that spring break is over, Madison College has two more indoor tournaments before it returns to outdoor play. The WolfPack will play two games in the Blue Knight Crossover Tournament on March 25 in the Irish Sports Dome in Rosemont, Minn. The team will then travel back to the Bubble at UCR Regional Stadium for the Rochester Community and Technical College Invitational on March 26. Two double-headers on the road will follow before Madison College opens its home season on April 3. 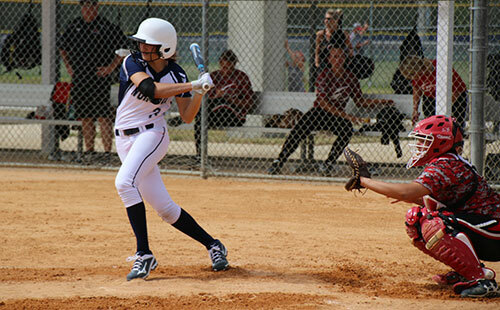 The final game of Madison College’s spring break trip to Florida was a hit-fest, with both teams slugging 12 hits a piece. But a five-run outburst in the top of the seventh inning gave the WolfPack the win. Lindsey Bolling led the team with a game-high four RBIs. Four players had two hits a piece for the WolfPack, including Bolling, Seeber, Heck and Cheyenne Holmes. A strong pitching effort by Jensen gave Madison College a 4-0 victory over Ancilla College on March 18. Jensen helped the team overcome five fielding errors by limiting Ancilla to four hits. Four fielding errors were too much for Madison College to overcome in a 7-3 loss to Iowa Lake Community College on March 17. Madison College scored three runs on five hits, including a two-run home run by Meredith Holt. Seeber had two hits to lead Madison College. Madison College had just three hits as it lost to Ancilla College, 2-0, on March 16. Seeber, Heck and Bell had the WolfPack’s only hits. Wilson pitched a strong game for Madison College, allowing just three hits and two earned runs over seven innings. 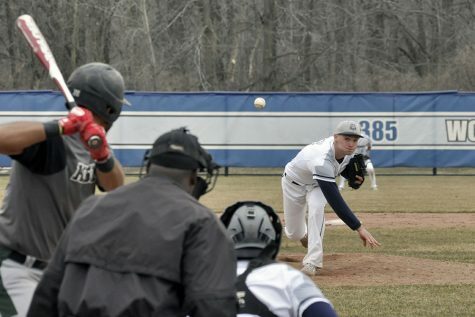 After allowing 11 runs in four innings, Madison College avoided the shutout by scoring twice in the top of the fifth inning against Spoon River College on March 15. Seeber had two hits for the WolfPack. A three-run second inning gave Marshalltown all the scoring it would need in a 4-2 victory over Madison College on March 15. The WolfPack managed just four hits in the game, and Heck had two of them. . Jensen pitched the loss, giving up just three earned runs and striking out six batters. Muscatine Community College scored seven runs in the first two innings to record a 10-2 run-rule victory over Madison College on March 13. Seven players had hits for Madison College, led by Bolling and Holt, who both had doubles. A five-run first inning set the tone as Madison College dominated Monroe Community College, 13-2, on March 13. Madison College had 13 hits and committed just one error. Seeber, Heck, Holmes and Bailey Kratt each had two hits. Wilson pitched a complete game, allowing just three hits. Despite leading throughout the game, Madison College had to hold off an Illinois Valley rally to post a 5-4 win on March 12. Seeber led Madison College with three hits, while Kratt and Bolling both had two hits. Jensen pitched the win. A walk-off single by Heck gave Madison College a 3-2 victory over Saint Clair County on March 12. Heck knocked in two runs with a two-out single in the bottom of the seventh inning to give the WolfPack the win. A five-run fifth inning helped give Madison College the boost it needed for a 6-5 extra-inning victory over Marshalltown on March 11. After its big rally, the WolfPack pulled off the win when a single by Bell scored Danielle Savignac in the bottom of the eighth inning. Madison College was unable to avoid a run-rule loss despite a five run fourth inning, falling to Kalamazoo Valley, 15-6, on March 10. Holmes hit a grand-slam in the fourth inning. A fielding error allowed three unearned runs and provided costly as Owens Community College beat Madison College, 4-2, on March 10. The WolfPack limited Owens to just three hits, but committed five errors.